...I give you the 'Hell a Cometh Swift Edition' (Which is another anagram for "All of Them Witches"). Brooding, atmospheric black n white rendering of Polanski’s classic. To improve pacing, MusicEd trimmed scenes here and there. Few will notice or mind. No major plot alterations. Video - 720p, MP2V. As noted, black n white. Image is rather soft, though nice looking. My preference would have been for boosted contrast, aiming for the Noirish feel. Still, this edit is served well by black n white. Cuts and transitions are smooth and well done. Audio - 2 Channel, 192 Kb. No subs, though not necessary because the dialogue is wonderfully caught. This has always been an insidious film where viewer are forced to eavesdrop on to uncomfortable conversations and sounds, yet denied audio information in other scenes. As before, MusicEd’s editing is top notch. Narrative - The edit is cohesive and flows quicker than before. Note to “modern viewers” this remains a leisurely paced experience. This is also not a pick-up, put-down, pick-up film, or one to screened whilst multi-tasking. This is best seen in one full sitting. MusicEd’s edit progresses logically with nothing awkward. Note - I think the foreign man in the white outfit was referenced more in Levin’s book, but I’m not sure. I leafed through my wife’s vintage paperback without success. In it’s day, Ira Levin was wildly popular and “Rosemary’s Baby” was a monster best-seller. Many more people read then and film makers relied on collective memory to fill in details. Enjoyment - I enjoyed this a lot. I understand - actually, I don’t understand - I realize many viewers do not like black n white. The pace is also deliberate, which often causes impatient sorts to scratch the FF button. Know thyself. During a second look, at one point I switched off the audio, liked what I saw, and kept it off until the credits. The actors were mostly old pros, accustomed to conveying a great deal of emotion and intensity with their faces alone. Expressions, facial tics, and reactions were arresting. If you know the film, this works great as a silent and is a tour de force for drama buffs. Applause to MusicEd for the anagram for All Of Them Witches (also in Levin’s book). Great touch. I was hesitant to watch because of the black and white but it was a really nice touch and was very watchable.All the edits where seamless and I was very much entertained.Thank you very much MusicEd921 for your time and effort with this edit. This was a pretty great edit. 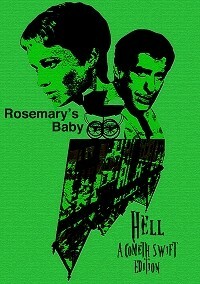 Long ago I bought Rosemary's Baby but just never got around to watching it. Simply put, I knew the ending already (due to pop culture osmosis) and I've never been a fan of Polanski's films. I saw that Ed was uh... ed-iting it, I decided to finally give the original a watch. And it was damn good. A bit too slow (but that's understandable, a good many "older" films feel slow compared to today's flicks) but very moody and some fine acting on display. Enter the "Hell a Cometh Swift Edition". The black-and-white treatment looks superb to me, this is how it should have been filmed. The pacing is much better (although I think it still could be a little shorter) and overall Ed has improved upon a classic!